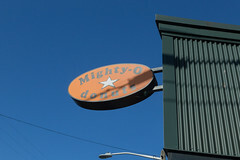 Mighty O Donuts is actually a small Seattle area chain, running a handful of donut bakeries, with locations in Greenlake, Ballard, and Capitol Hill, the first of these being the location we visited. Having been peddling donuts around the Seattle, first at farmers markets and then retail locations, they’ve been making all of our own donuts every since, along with a good selection of apple fritters and other related bakery treats. Oh, and one other little detail: they are vegan (well, except for the cream for your coffee). That’s right, all of the wonderfully tasty, crispy, delicious donuts are made with vegan and organic ingredients, which is an added delight for my lactose-intolerant self that’s always seeming to find milk products worked into various dishes. But enough of that, let’s actually talk about the donuts. 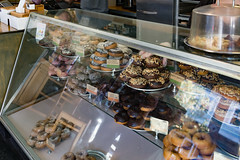 Every day, they’ve got more than a dozen varieties of donuts, all freshly made, and ready for your selection. 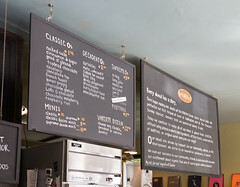 The selection includes a good selection of “normal” donuts, such as a good old “cinnamon and sugar” and glazed varieties. And your basic fancy donuts as well, like raspberry glazed, double-chocolate, and the like. And then a whole selection of “Decadent” donuts, including PB&J, grasshopper, cuckoo for coconut, and even one I didn’t remember to ask about, the “Don King”. 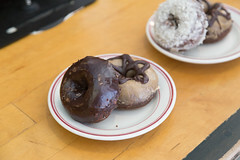 I ended up selecting a pair of donuts: a “Lot’s o Chocolate” and a “Peanut Butter Cup”, and both were quite pleasing: the chocolate donut started with a solidly-executed chocolate cake donut, with a rich chocolate flavor, soft cake, and just enough donut crispiness to make this a donut instead of a circular cupcake. Add in a nice, rich chocolate glaze, and it was a fine donut indeed. 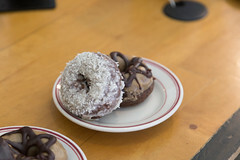 The Peanut Butter Cup was similar: the donut itself having a modest and not overpowering peanut flavor to it, with a little bit of both peanut and chocolate glazing on it. Again, a fine donut. Carol’s selection involved another Peanute Butter Cup and the “Cuckoo for Coconuut”, the latter being a nicely executed basic donut with a very generous dusting of coarse-grated coconut. Again, quite the winner. I’ll have to hand it to Mighty O. Every since the resurgence of Krispy Kreme in the late ’90s, there’s been quite the rush of donut bakeries showing up, and despite this, places like Mighty O still seem to find a good niche. Here, it’s solidly-executed donuts made with quality ingredients, served up in a pleasant little neighborhood bakery. All this while also being vegan. I’ll have to give them some credit, it’s a good combination.